The round also saw participation from a few individuals working in the investment banking, education and mobile industries. The round was co-led by Utsav Somani, a member of Indian Angel Network, and Shankar Narayanan, MD of Carlyle Group. “We will use the funds in three areas -- product, content and marketing. We are aiming to reach 2 million users by mid-2015. Content expansion is going to be massive, with many innovative features coming from the tech side to ease the preparation,” said Ashutosh Kumar, co-founder of Testbook. 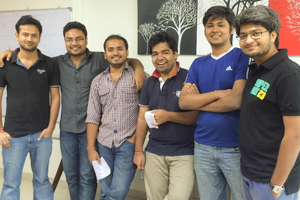 The startup was founded early this year by a group of IIT Bombay and IIT Delhi alumni -- Ashutosh Kumar, Narendra Agrawal, Yadvendar Champawat, Abhishek Sagar, Manoj Munna and Praveen Agrawal. Testbook is an online test preparation platform for competitive exams like GATE, CAT, SBI PO, SBI Clerk, IBPS PO, etc. covering practise, testing and learning needs of the students. As of now, around 50,000 students have registered on its platform, which is currently free. Testbook is planning to earn money by providing premium content to users in future. There are many other online test prep platforms. Early this year Mumbai-based Individual Learning Pvt Ltd that runs Embibe.com, an online test prep portal specialising in engineering entrance exams, had raised $4 million from early-stage investor Kalaari Capital and newly formed venture fund Lightbox. ah! Ventures is a network of 280 investors. Early this year, crowdfunding and community engagement platform Catapooolt had raised an undisclosed sum in seed funding from ah! Ventures. LetsVenture is an online platform that connects entrepreneurs with investors. Recently, Delhi- and US-based AdPushup Inc., a startup that provides an A/B testing platform to enable web publishers and bloggers to create & test different ad placement, size and types to optimise their ad revenues, secured $632,000 in funding from LetsVenture.